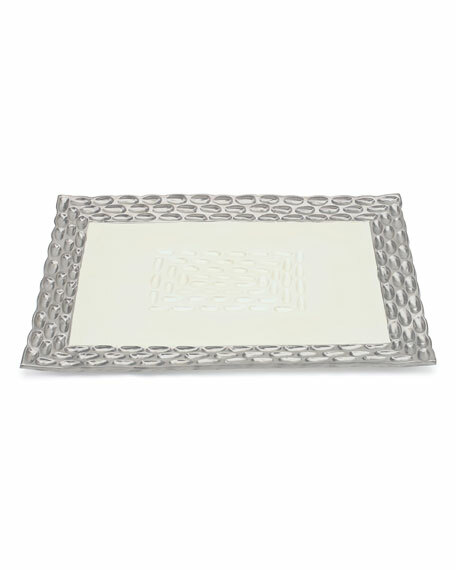 Porcelain tray with platinum detailing. From the cathedrals of Italy to the windswept dunes of Cape Cod, Michael Wainwright's journeys combine with his mastery of sculpture and experience as a jeweler to create timeless, functional works of art. While studying in Italy, he was inspired by the halos and angels of Giotto, Cimabue, and other early Italian masters. He was also attracted to the use of precious metals in architecture. He established his design firm in 1991 and works out of a studio in the Berkshires of Massachusetts. His distinctive tabletop and decorative items have been featured in Bon Appetit, Gourmet, and House & Garden magazines; all are handcrafted of porcelain mixed with platinum or 24-kt. gold, and all are made in the United States. For in-store inquiries, use sku #1626556.